Join the Western Australian Youth Orchestra in an all Australian program of exciting works. 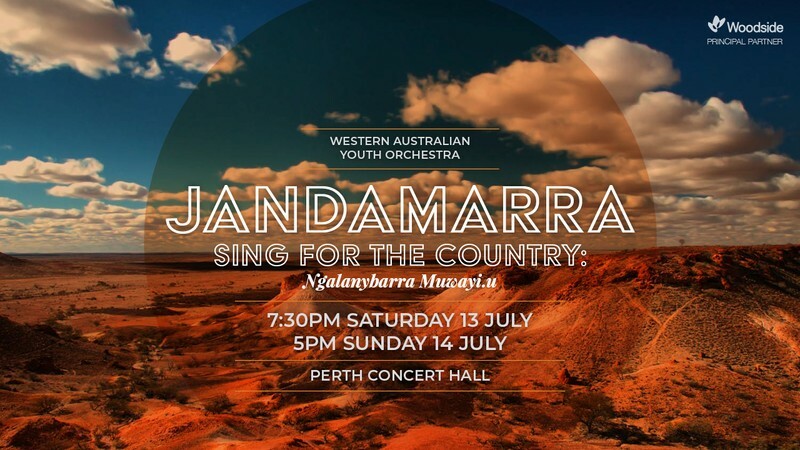 Featuring masterpieces by Sculthorpe, a world premiere by Australian composer Melody Eotvos, and the legendary epic tale of Jandamarra Sing for the Country: Ngalanybarra Muwayi.u. Set in the dramatic landscape of the central Kimberley, Jandamarra tells the story of an indigenous Western Australian warrior and leader of the Bunuba resistance of the 1800’s. In a strongly collaborative environment, WAYO will join forces with multiple youth choirs, soloists, and an indigenous ensemble of musicians and actors from the Bunuba People to bring this dramatic cantata to life. Unique, impactful, and historically vital—become part of the story today.